Ella Pamfilova will succeed Vladimir Lukin as Russia’s commissioner for human rights. 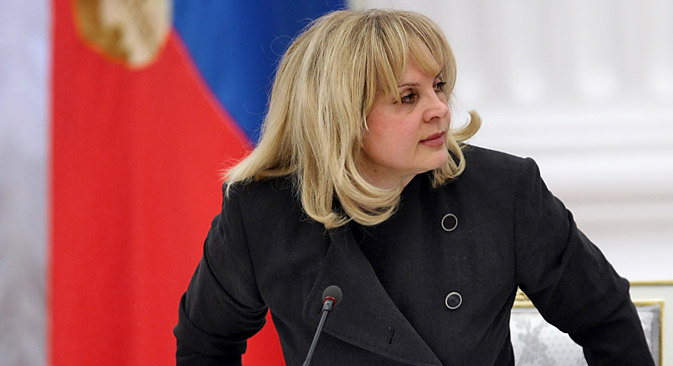 For the first time, a woman has been appointed Russia’s commissioner of human rights. On March 18, the State Duma approved the candidacy of Ella Pamfilova, a former Duma deputy and head of the Council on Human Rights. In a speech to the Duma after her appointment, Pamfilova named corruption as the main challenge to improving human rights in Russia. “I see high-level corruption, especially in law enforcement, as the fundamental threat to the protection of human rights. This is our common task, to remove the criminality not only from our state structures, but also from our commercial ones,” Pamfilova said. The office of human rights commissioner was established in 1993 as part of the new Russian Constitution adopted that year. According to the law, the commissioner exercises his or her authority independently. The role of the commissioner is to investigate complaints about human rights violations by state officials. The commissioner supervises a network of regional representatives who help him or her in investigating complaints. If the representatives determine that a complaint is valid, the complaint is referred to the commissioner who can appeal to the court system. In the case of gross or massive violations of the rights and freedoms of citizens, the commissioner has the right to appeal to the Russian parliament or can propose the creation of a special commission to conduct a more in-depth investigation. Pamfilova will replace Vladimir Lukin, who served a full 10-year term as commissioner. In an interview with Rossiyskaya Gazeta, Lukin supported Pamfilova’s candidacy. One focus of Lukin’s work during his time as commissioner was conditions in Russia’s prisons and the treatment of prisoners. He said that Pamfiova will need to continue this work. Lukin added that he had never faced resistance from officials to his work. “Overall, I cannot say that the government actively interfered in our activities. In some aspects they even helped us,” Lukin said to Rossiyskaya Gazeta. For her part, Pamfilova said she was interested in reexamining the case of the Bolotnaya protestors, seven of whom were sentenced to jail terms earlier this year for participating in a mass riot and resisting police. Determining rules and regulations for demonstrations and street actions also falls under the umbrella of the commissioner for human rights. Leonid Polyakov, head of the Department of General Political Science at the Higher School of Economics National Research University, said that the commissioner must have a strong personality and be prepared to speak out against the power structure, and that Pamfilova has the necessary qualities to make the position a strong force in the Russian government. “People in this office can put serious pressure on governmental authorities. State bodies always strive to control everything, but the existence of such a post actually serves as a counterweight,” Polyakov said. Elena Topoleva-Soldunova, director of the NGO Agency for Social Information, said that Pamfilova shares many principles with Lukin, but as a woman, she will bring a different kind of character to the post. “The figure of the commissioner for human rights is very important, but she cannot change everything. This position requires a person who is authoritative and even a bit emotional. So that is why it is very good that specifically a woman will hold this post. Such an ombudsperson cannot simply be waved away,” Topoleva-Soldunova said. Ella Pamfilova began her career as minister of social protection in the government of Prime Minister Yegor Gaidar. She was elected to the State Duma three times. She left the Kremlin in 2010 after several conflicts with the pro-Kremlin youth movement “Nashi” (Ours).